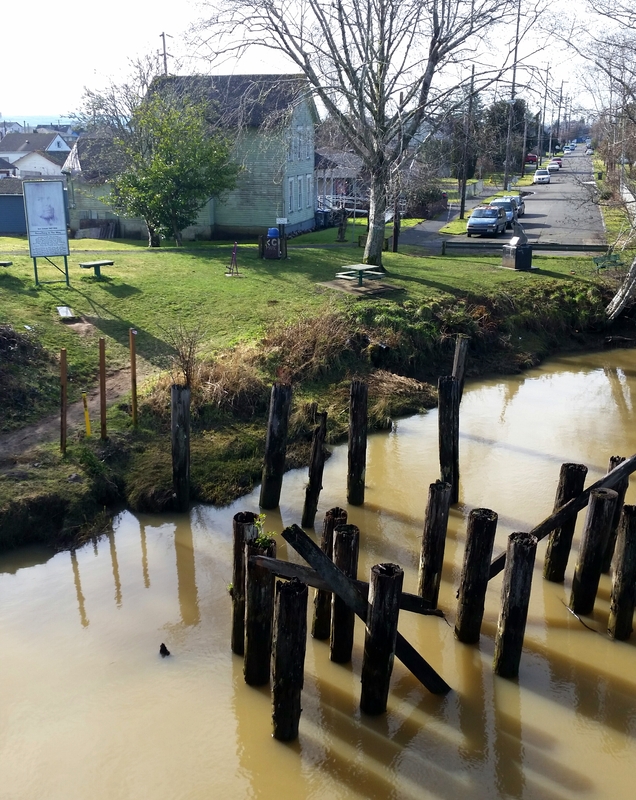 If you’re a Nirvana fan within driving distance of Aberdeen, WA sooner or later you’ll probably wanna hop in the car and wander over to see the city where it all began. There are certainly some Nirvana sights to see in Aberdeen. Diehard fans will probably seek Kurt’s childhood home, or “Kurt Cobain McDonalds”, which has a print of a famous Cobain portrait on the wall. For awhile the sign on the edge of town greeted visitors with “Come as you are”, but either ‘Kurt-mania’ has ebbed or Aberdeen reclaimed the logging championship belt because these days it’s back to “Logging Capitol of the World”, but luckily for fans that picture is still up at the McDonalds. Kurt Cobain Memorial Park is located in the colorfully named “Felony Flats” neighborhood of Aberdeen, WA at the end of a short dead end street. It’s a pleasant grassy park, with a few trees and estuarine waterfront. 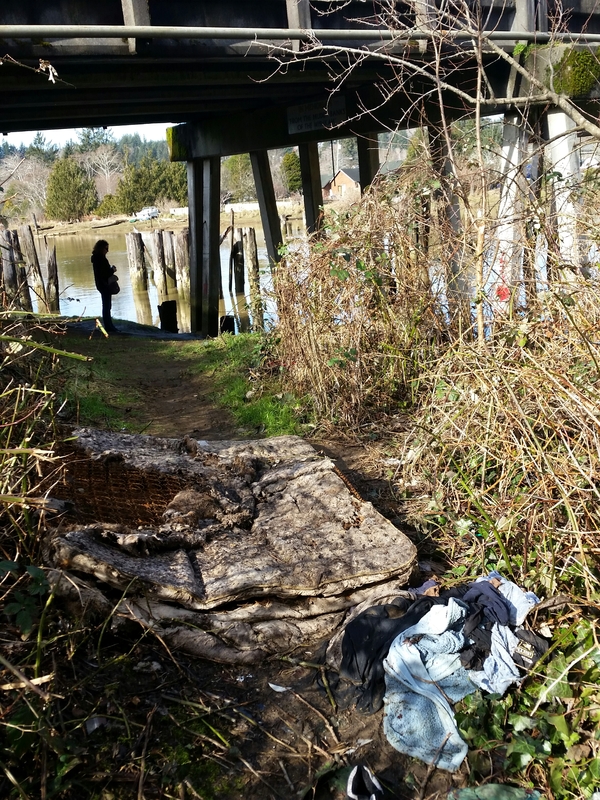 A handful of monuments and benches are loosely arranged throughout and the pillars of the Young Street Bridge and a collection of decaying creosote pilings lend the backdrop. A Jagstang guitar statue stands near the riverbank at the entrance to the park. Cobain, a frequent player and sometimes destroyer of Fender Jaguar and Mustang guitars, designed a sort of hybrid of the two in 1994 with the Fender company and thusly the Jagstang was born. 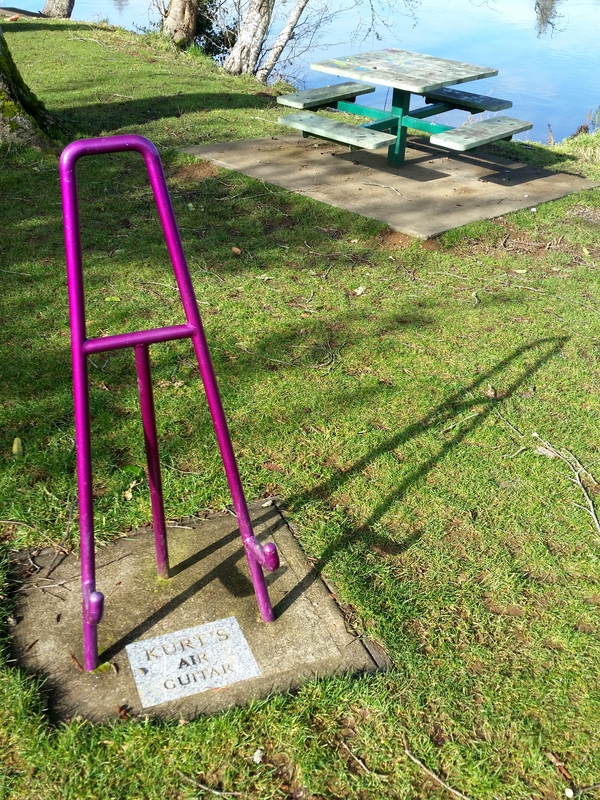 “Kurt’s Air Guitar” is also on display, and free for the public to use. Belt out a few jams! The bridge itself may be the ultimate memorial; immortalized in Nirvana folklore as a refuge for the young artist during his tumultuous teenage years and as the inspiration for the song “Something in the Way”, it is for some perhaps a sort of muddy Graceland. I imagine a lot of people might take pause before going under the bridge. I won’t lie, it looks a bit rough. 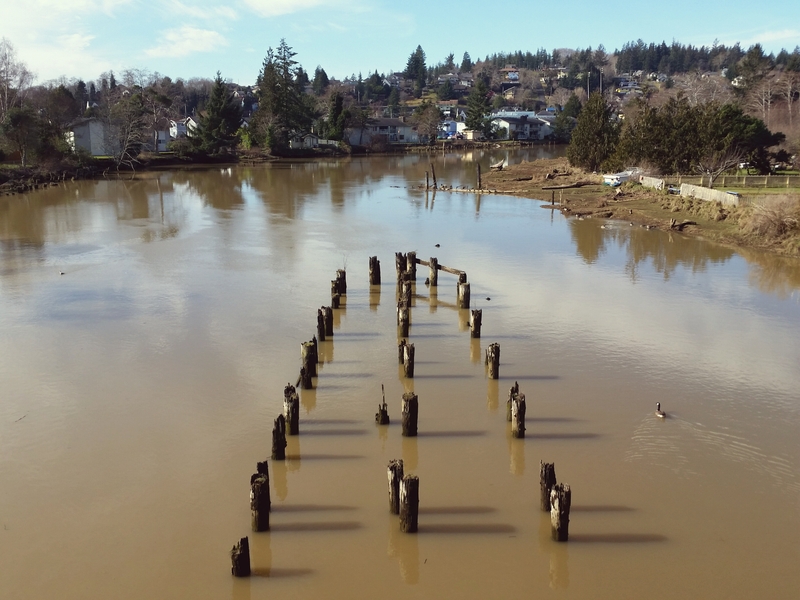 Like the name of the 1996 post -Nirvana release “From the Muddy Banks of the Wishkah” implies, the banks of the Wishkah River really are muddy, and pretty slick. Watch your step! In addition to the mud, there are occasionally strange leavings beneath the bridge. Last time there seemed to be a lot of funny looking orange caps and what was said to be historical “Kurt’s Mattress”. 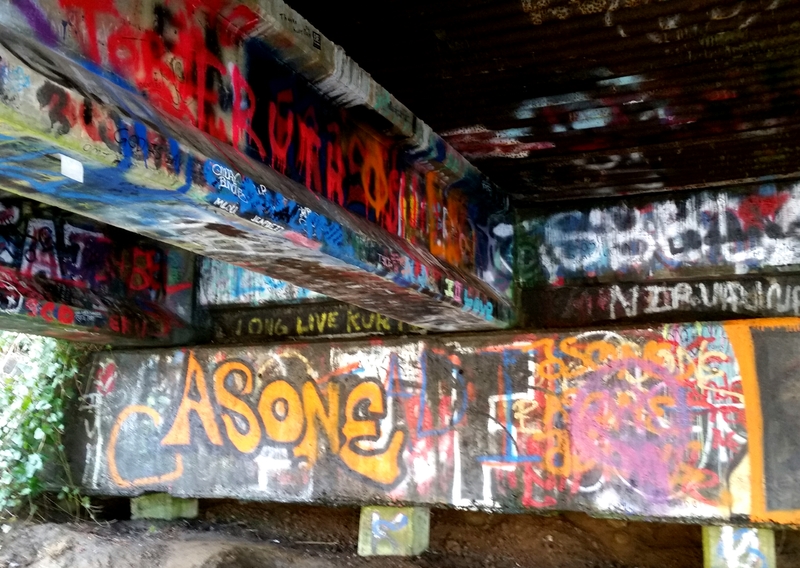 The underside of the bridge has become a cacophonous shrine, blasted with spraypaint and the disembodied messages of pilgrims who have come to pay their respects to the troubled song writer. For fans, this is it. Take a minute to watch the eternal waters flow by and try and channel your inner angsty teenager. If you’re feeling it, don’t be ashamed to cut loose on some air guitar while you’re down there. Most people will give you a lot of space to jam, they might even head right back to the car when they see you. From wherever you are coming from, you’ll have to get to Aberdeen,WA. I’ll leave that to you. Traveling westbound to Aberdeen on the WA-12: As you enter Aberdeen, you’ll pass a large shopping complex on your left just before a drawbridge crosses the river. Take a right after the drawbridge at the earliest convenient intersection. The next intersection should be with East Market Street, turn right (east). Follow it east for a little bit, the road will begin to bend northward becoming Young Street, take a left into the neighborhood on Chicago or Stanton Street. If you cross the bridge, you’ve gone too far. I couldn’t help but laugh at the “air guitar”!